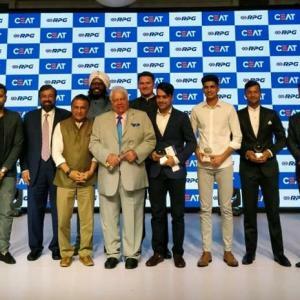 Rediff – India captain Virat Kohli was named as the International Cricketer of the Year at the CEAT Cricket Ratings awards in Mumbai, on Monday. India captain Virat Kohli was named as the International Cricketer of the Year at the CEAT Cricket Ratings awards in Mumbai, on Monday. Among others award, opener Shikhar Dhawan was presented the International Batsman of the Year Award, while New Zealand pace sensation Trent Boult won International Bowler of the Year Award. Afghanistan leg-spinner Rashid Khan, who impressed everyone with his skills in the recently-concluded Indian Premier League grabbing 21 wickets, was presented with the T20 Bowler of the Year Award. Woman cricketer Harmanpreet Kaur, who single-handedly took the team to the final of the ICC Women’s World Cup with her breathtaking knock of 171 not out against Australia in the semi-final, won the Outstanding Innings of the Year Award. Eighteen-year-old Shubhman Gill, who made his mark in the Under-19 World Cup in Australia and the IPL while playing for the Kolkata Knight Riders, was conferred with the Under-19 Player of the Year award. Who is Alastair Cook’s wife and when did ex-England cricket skipper wed her?